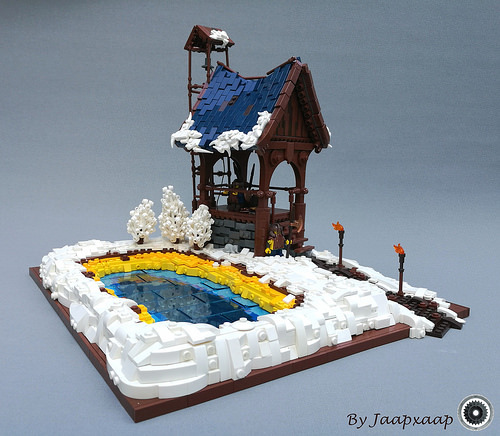 What better place to stand guard during the winter than by a hot spring? The scenery in this diorama by Jaap Bijl truly is something to look at — in fact, perhaps it’s “scenery” that the dwarves are protecting! The builder has used his signature sagging roof style lined with a bit of snow, along with some nice wood construction on the building. While the building uses some new ideas, the star of the show is the hot spring. It uses window pane pieces as the water to make the surface extremely smooth, giving it a great reflection and allowing the deep colours underneath to be seen. These colours continue outwards on the shore in a gentle gradient to the sulfuric yellow that ends under the snow.